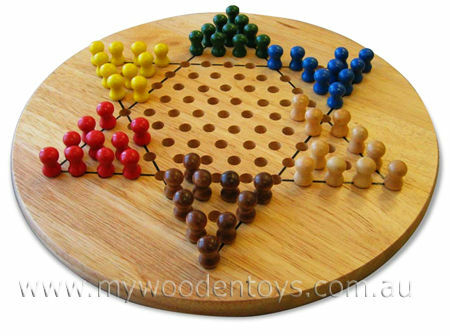 Wooden Chinese Checkers is a beautifully made solid wooden version of this traditional game. The point of this game is to move all your coloured pieces from one point of the star across to the point opposite you. You do this by hopping over an adjacent peg and into a the vacant hole directly beyond it. Each hop may be over any coloured peg including the player's own and can proceed in any one of the six directions. After each hop, the player may either finish or, if possible and they want to, continue by hopping over another peg. When all your pieces are on the other side you have won. But of course the other player or players (between 2 and 6) will be coming in the opposite direction and can block you. We like this because: "Great game and very addictive ."